Melina's Conquest iPhone Game Review. Vile monsters, magical portals that take you from one danger-filled land to another, and a conquest. Do you think you can handle it? There's no need to turn on your computer to check out this action filled game. 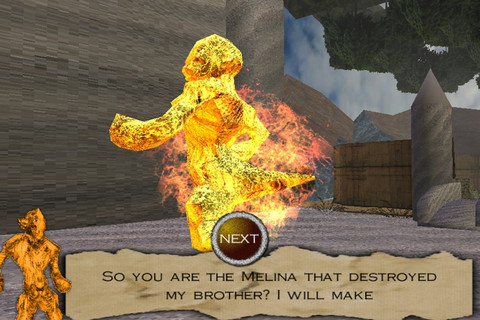 Just grab your iPad and download Melina's Conquest. 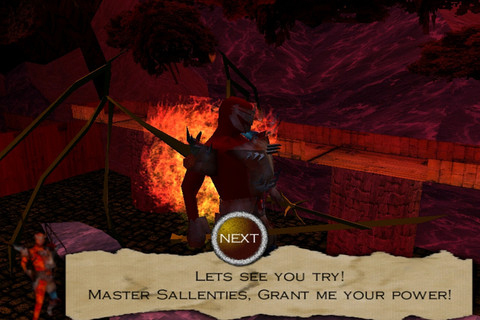 Melina’s Conquest is an RPG for the iPad in which you play Melina, a medieval warrior, whose quest is to save her mentor from the hands of the biggest, baddest and ugliest monster the world has ever seen. Your job is to guide her from one portal to another, until she reaches this villain and saves her mentor. With every level cleared, you go through the portal to the next level and enter a more dangerous land than the previous one. And if at first you only had to kill a couple of little monsters, wait until you get to the first true villain. That is Gilleon and it will take more than a couple of cuts to kill him. He's ten times your size and he's an easy kill compared to the next to come. Gilleon only has a weak spot (his shoulders). But don't think that it is right under your nose and you won't have to struggle to take him down. Besides monsters, there are also other dangers that you will have to face. From slippery platforms that will knock you off your feet straight into a hole, to sharp spiked platforms that can squeeze you to death in a couple of seconds, Melina's Conquest isn't an easy task. But you also get help. There are fountains that fill your power up and weird creatures that will give you a heads up to what's next to come. The background sound really makes you feel like a medieval character, but the design is not mind-blowing. From the low resolution images to the similar looking backgrounds, which make some levels look exactly the same, Melina’s Conquest seems like an RPG taken right from the history book. I used to play such games in my PC era, when the best computer there was only sported a 400Mhz processor and 64MB of RAM, with integrated video cards. Surely we’ve come farther than this and I don’t understand why there wasn’t more work put into the graphical component of the game. 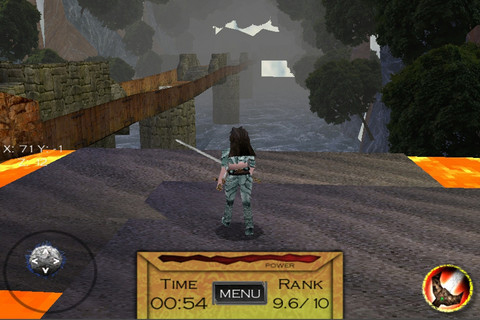 The controls themselves are based on a virtual directional pad located on your left hand, with the action trigger on the right. You can control the camera view by dragging the screen around, but every time you get to a milestone or after you talk to a character, the camera resets, so you need to reposition it the way you wanted it. All in all, Melina's Conquest is a great game that will instantly hook you, there's no question about it. Being an RPG fan myself, I put aside the graphics problem and played the game. But please guys, let’s do something about these 8-bit graphics! I look at Infinity Blade, Eternity Warriors, Pocket RPG or Order & Chaos and they blow Melina’s Conquest right out of the water. What do you think of Melina's Conquest ? Scroll down for our comment section and let us know!